Monday 5:47 pm - I've put off the start of the Tricky Eggs puzzle for a couple more days. No rush here and as I've not completed some non-puzzle tasks I'm not ready. The main thing I did today was to join together a whole bunch of small "Geyser Videos" I took near the Atacama desert region of Chile, and upload the video to YouTube, see http://white-knuckle/watch?v=EBbVNdUeOU4. This includes a video of me, plus one with an expletive as I was reacting to a small bubbly geyser which suddenly flared up in front of me while I was doing a close up! This video was shot at an elevation of 14,200 feet, the air was quite thin. I expect to start the Tricky Eggs puzzle on Wednesday. Wednesday 1:55 pm - Went to my shop today to start work on Creative Art with Two Tricky Eggs. I designed the location of the two eggs. Then I realized I wasn't ready to start cutting. 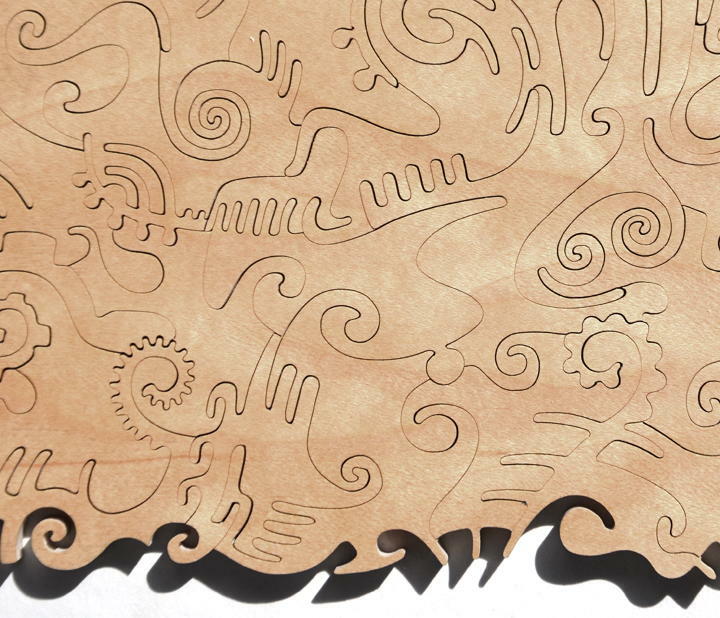 It had been a long time since I cut anything in Creative style, let alone a puzzle in a significant series! Six months at least. So I decided I needed practice. I found a 4x4 sample of Baltic Birch I picked up at last year's puzzle parley from Boulter Plywood. As the Tricky Eggs puzzles have about 1 piece per square inch, I decided to cut the 4x4 into about 16 pieces. Was I ever rusty! Overall OK, but I had major problems cutting a "same direction Whirly Curl" as I spiraled too far in before working my way out. Anyway I went ahead and finished it, 17 pieces, and for a lark decided to spray paint the fronts of the pieces. The wood had some problems went stressed, I had several chip-outs. The work will remain unofficial, unnumbered, untitled. Tomorrow I expect to do some cutting of the Tricky Eggs puzzle. Friday 5:22 pm - Wasn't until this afternoon that I was ready to start work on Creative Art with Two Tricky Eggs. Was at the shop for a bit over an hour, did some initial cutting with a grand total of three pieces cut. Off to a good start. Tomorrow there is a massive air show in San Diego, the Navy celebrating 100 years of flight, I plan to watch that. I expect to resume cutting on Sunday. Tuesday 4:17 pm - Yesterday I went to the shop and did about two hours of cutting, working on one half of the puzzle - subdividing, doing the irregular border, and did the tricky egg embedded in that half. Today I again went to the shop and did about one and a half hours of cutting, subdividing the other half, doing its border and doing the second tricky egg. There are just nine pieces done, including the two tricky eggs. The pace will pick up tomorrow, although again I plan to put in a fairly short day of work. I haven't lost my touch, the cutting looks good! 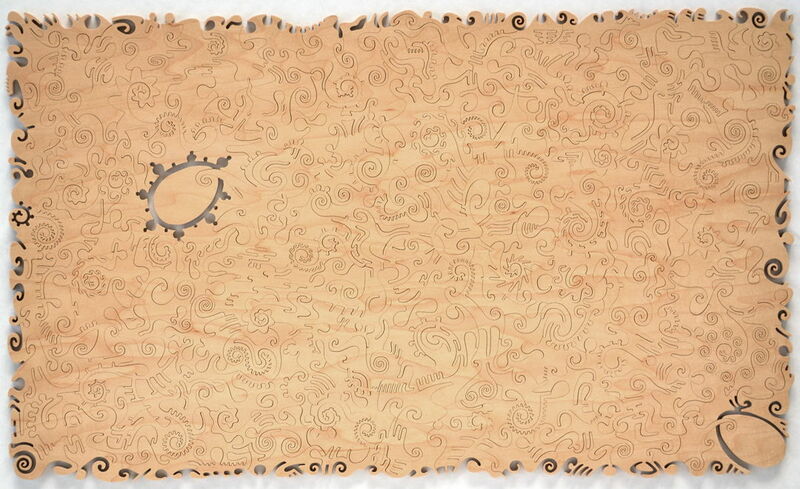 Received word that the Marriage Proposal puzzle "worked" as planned on Valentine's day! 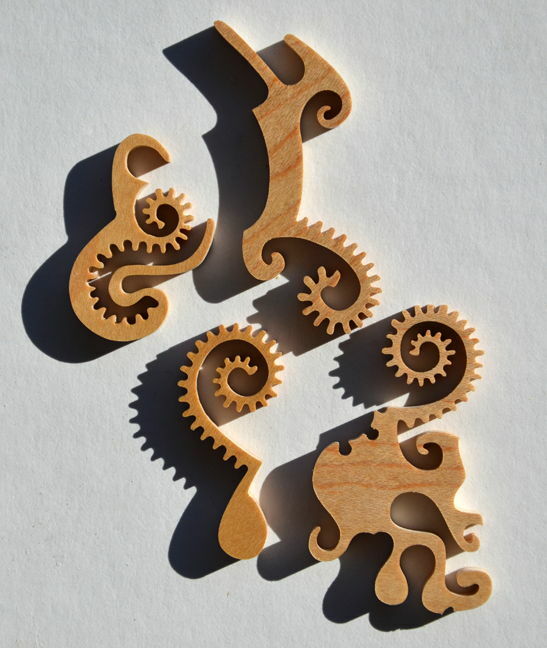 "Both Gerry and Jess (his new fiance) loved the puzzle! Thanks again for your craftsmanship and response time!". Thursday 4:44 pm - I'm continuing to work on #842, Creative Art with Two Tricky Eggs, working on it a few hours each day. Yesterday I was at the shop for about three and a half hours and cut about 60 pieces, today a bit less than three and cut about 45 pieces. So my 15 pieces an hour rate for Creative continues. There are some very nice areas of cutting. I've upped the estimated piece count to 215. Friday 5:14 pm - Today I did some excellent cutting, continuing to work on #842, Creative Art with Two Tricky Eggs, working a few hours, cutting 40-45 pieces. I have 55-60 to go. I expect to complete the cutting this weekend, then apply tung oil to bring out the cut. The auction will be next week. The will be a tiny bit of tweaking of the irregular border and embellishment around the eggs. Saturday 5:12 pm - Another afternoon session of cutting, cutting around 30 pieces, have around 30 to go, again some excellent and creative cutting! I expect to complete the puzzle tomorrow. Puzzle measures about 19 1/4" by 11 1/4". Sunday	4:35	pm -	The	cutting	of	puzzle #842, Creative Art with Two Tricky Eggs, is done, a worthy addition as the fifth puzzle of the planned six puzzles in the Tricky Eggs series. Creative Art with Three Tricky Eggs remains to be done (will do it next year). I was going to apply a couple coats of tung oil to one side, but the passage of time has taken a toll on my tung oil - now a can of jelly. Tomorrow I'll get a new supply and do the one side. I'll do the other side on Tuesday, will have pictures then. I've upped the estimated piece count to 225, will have the count by mid-week. Wednesday 3:15 pm - On Monday I applied two coats of tung oil to one side of the puzzle and yesterday to the second side. Today I brought the puzzle home and took some pictures. I'm now planning to launch the auction on Monday, February 28th. This will be the only puzzle I auction this year. Preliminary piece count: 237. 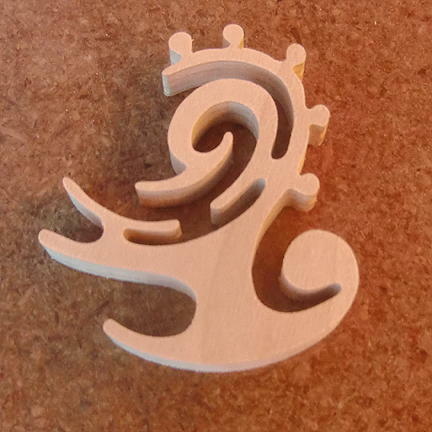 I plan to take pictures of some of the individual pieces this weekend and will have some discussion about the puzzle. I quite pleased about the work! Monday 7:56 am - The auction for puzzle #842, Creative Art with Two Tricky Eggs, is now planned to start tomorrow. 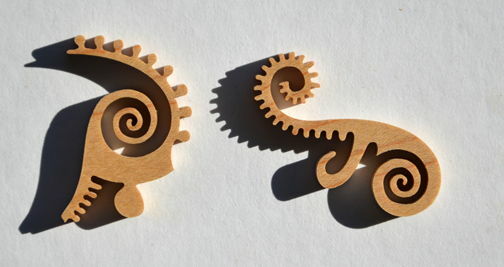 After much rest and a long break, I have decided to start a new series of Custom Puzzle Craft wooden jigsw puzzle actions now that the 100 Puzzles Project is well behind me. This series is less ambitious in scope and is open ended. The series consists of one puzzle auction per year for a duration extending probaby for as long as I'm able, have the desire, and have access to puzzle making equipment. I'm 60 years old now so I'll let the actuarials speak for themselves. 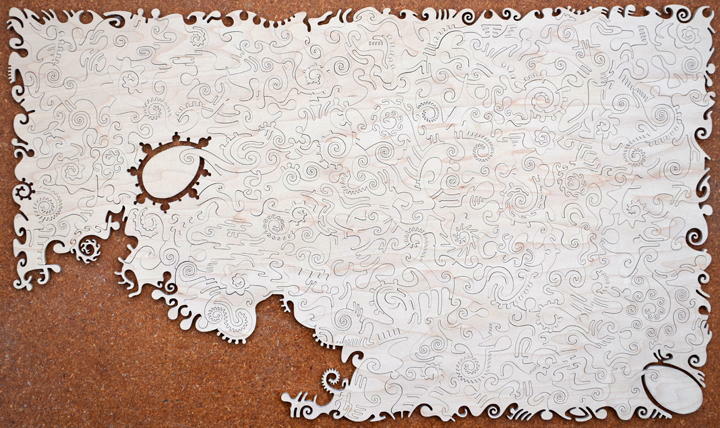 About 19 1/4" by 11 1/4""
This is the first puzzle in my Annual Puzzle Auction series. 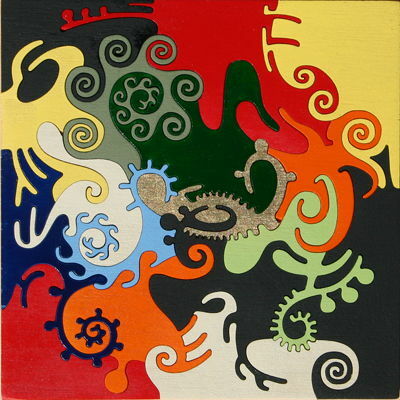 This puzzle, Creative Art with Two Tricky Eggs is the fifth puzzle of the Tricky Eggs series, there is one more to go, and it will be the next year's Annual Puzzle Auction puzzle. The following table shows the history of my Tricky Eggs series, with links to pictures of the puzzles. Note: The "Five Tricky Eggs" puzzle was #95 in the 100 Puzzles Project. 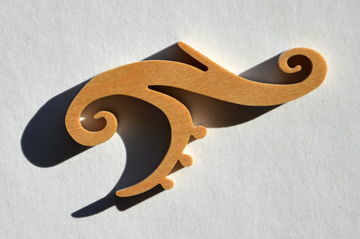 The series started when fullfilling an order for a plain wooden puzzle cut in my Creative Style, I came up with the idea of putting a "Tricky Egg" puzzle piece in one of the corners and the rest is history! As I've made ones with 1, 6, 4 and 5 Tricky Eggs I had just the "2" and "3" slots to fill. One with 7 Tricky Eggs would be a huge undertaking and I have no plans to make one. 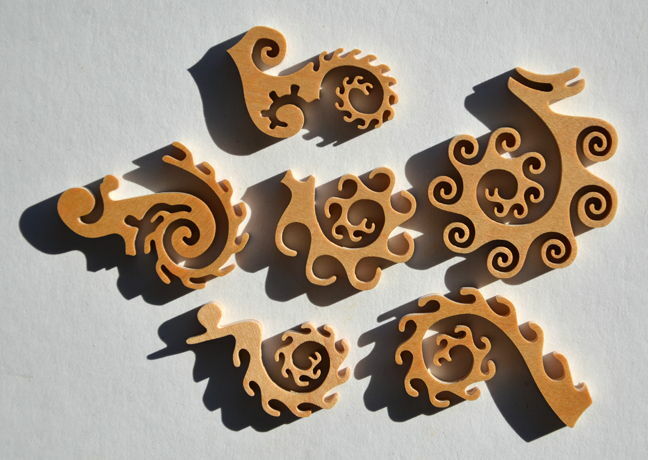 These puzzles are noted for their particularly elaborate cutting and I find great joy in "wood dancing", with great care spent in making how the pieces look when placed together look elegant. This puzzle, with 240 pieces, was cut at a very slow rate for over a week, a few hours a day, with less than 15 pieces cut per hour on average. After the puzzle was cut, I sanded it w/ 320 grit sand paper and applied two coats of tung oil to each side. I took care to cut the pieces so they wouldn't be "too delicate" although there are some moderately delicate pieces in the puzzle, relatively speaking. I plan to individually wrap each piece in tissue paper when shipping the puzzle. My "Tricky Egg" series of puzzles do not include my standard signature pieces, rather I select a nice looking piece and sign the back (yes there is a back) of it in the usual way (Custom Puzzle Craft, overall puzzle number, date and my signature) and I'll mark a second piece on the back to indicate the puzzle is Annual Puzzle Action #1 with the year. 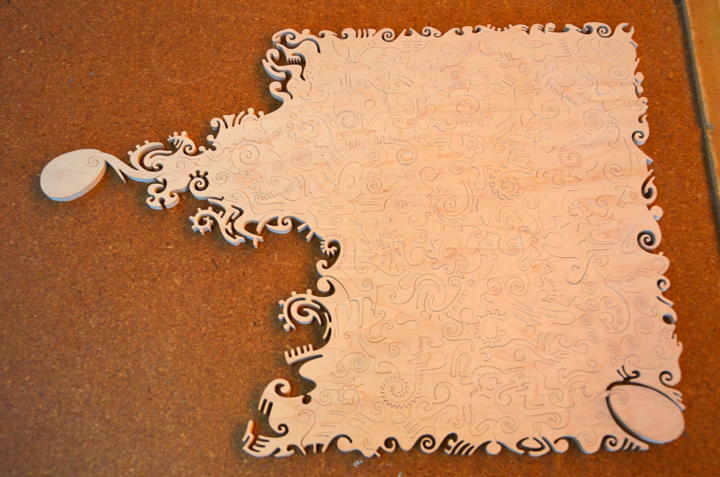 For this puzzle I used 5-ply Appleply. The Appleply cut extremely well, there are no chipouts on the front or back. There are two pieces which are quite a bit smaller than the others, this is deliberate, so don't think some pieces broke! 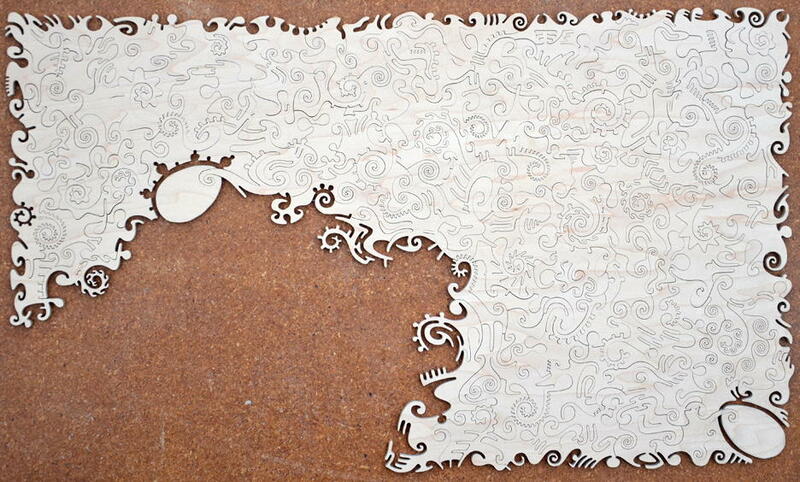 One of my favorite pieces in this puzzle, hard to tell where I started cutting this one! 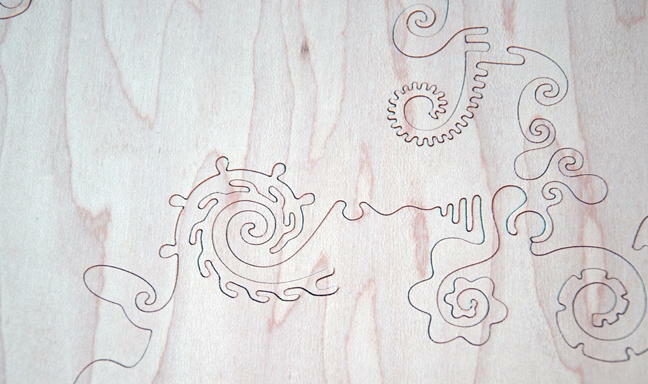 Note: I cut my jigsaw puzzles using a scroll saw, hand guiding the wood into the blade, this is not a laser or water jet cut puzzle. 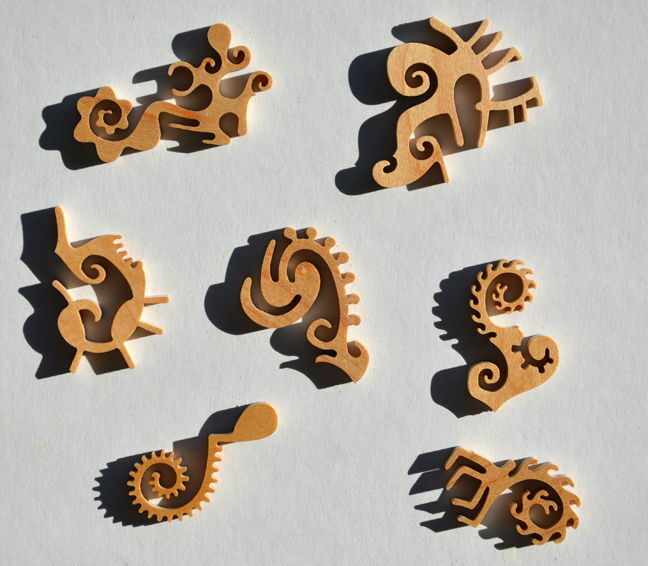 No templates was used for this puzzle, except some rough sketching on the wood for the Tricky Eggs pieces and associated connectors pieces. My puzzles cover fantasy, landscapes, my geometric patterns, famous paintings, mythology - a diverse spectrum of the human condition and more. 19 1/4" x 11 1/4"